Release Date: January 31st, 2007 (IFC Center) by IFC First Take. Directed by Henriette Mantel and Steve Skrovan. 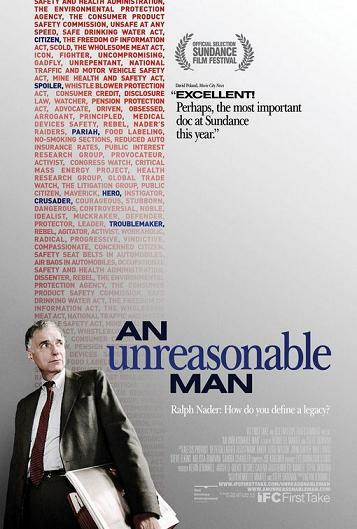 BASIC PREMISE: A documentary about the highs and lows of Ralph Nader’s career in politics. ENTERTAINMENT VALUE: An Unreasonable Man provides a comprehensive history of Ralph Nader’s involvement in politics from the 1960’s when his book Unsafe at Any Speed , about the poor safety of automobiles, made him become famous until the 2004 elections when he lost most of his friends and allies. Co-directors Henriette Mantel and Steve Skrovan do a decent job of incorporating interviews and news footage to paint a picture of what went on during those years which led to Nader’s lowest point in 2004. Nader wanted to be different from the Democrats and Republicans by focusing on the environment and felt concerned about the welfare of consumers. What’s interesting about his personal life is that he doesn’t really have much of one because he works so hard—he never even mentions any love interests in his life because he has always been married to his work, so-to-speak. He seems quite focused and intriguing during interviews and public speeches, but mainly before the 2000 elections when many people claimed that, by including himself in the presidential race as the Green Party, he took away Democratic votes that would have made Al Gore win instead of George W. Bush. When friends and allies no longer support him, he looses his focus and gets angry yet still manages to carry on with his political activism. For those who don’t know much about Nader, his strengths or his weaknesses, this 122-minute documentary will be quite fascinating. However, for everyone else, Mantel and Skrovan don’t analyze or synthesize his strengths and weaknesses enough to make this truly compelling. SPIRITUAL VALUE: It’s somewhat inspiring how Nader’s courage allows him to go on with his political activism as an underdog who faced the Democrats and Republicans. He has made mistakes, just like any fallible human does, and clearly has issues with people leaving his Green Party, yet he doesn’t give up. INSULT TO YOUR INTELLIGENCE: Not enough synthesis of Nader’s strengths and weaknesses. IN A NUTSHELL: Mildly fascinating and comprehensive, but not compelling enough.